With breathtaking fuel economy ratings of up to 28 city/36 highway1, almost everybody loves the 2018 Toyota Corolla. And how couldn’t they? It’s great! However, recently, a lot of drivers around Plainfield, Indianapolis, Avon, and the surrounding Indiana communities, have started to take notice of the 2018 Nissan Sentra. So, we wrote this vehicle comparison. We’d like to clear up the differences and similarities between the 2018 Toyota Corolla and the 2018 Nissan Sentra. So, if you have any further questions, please reach out to us at Andy Mohr Toyota. 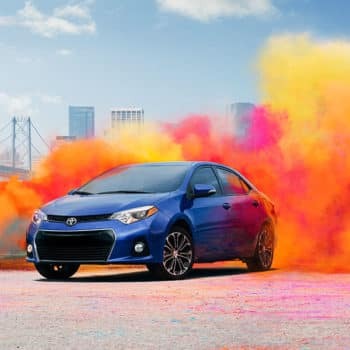 One of the first things that you’ll notice about the Toyota Corolla is its beautiful color palette: Classic Silver, Black Sand, Barcelona Red, Super White, Blizzard Pearl, Slate Metallic, Falcon Gray, Blue Crush, Galactic Aqua, etc. Regardless of which one you pick, you’ll almost certainly turn quite a few heads. And that’s without even getting into the rest of its exterior: sporty front fascia, Bi-LED headlights, 17-inch alloy wheels, a rear spoiler, and more. Unfortunately, the Nissan Sentra simply can’t keep up. So, since the Nissan falters in comparison to the Toyota on the outside, let’s check out safety systems. 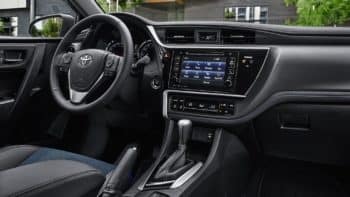 2018 Toyota Corolla: eight standard airbags, Star Safety System™, TPMS (Tire Pressure Monitor System), Whiplash-Injury-Lessening Seats, and Low Anchors and Tethers for Children (LATCH). Cool! 2018 Nissan Sentra: Fortunately, this sedan comes with quite a few safety features and systems that are comparable to the Toyota Corolla’s, including Tire Pressure Monitoring (among others). Best of all, if you break down Toyota’s Safety Sense™ P, you’ll see that it includes tons and tons of tech, like Pre-Collision System with Pedestrian Detection, Lane Departure Alert with Steering Assist, Automatic High Beams, and Dynamic Radar Cruise Control. Last, but certainly not least, we’ll take a look at the available engines for these two sedans. For the 2018 Toyota Corolla, you’re working with a 1.8L 4-Cylinder DOHC 16-Valve Engine with Dual Variable Valve Timing with Intelligence that spits out 132 horsepower at 6,000 RPM and 128 lb-ft of torque at 4,400. Or, for the 2018 Nissan Sentra, you’re dealing with some engines that only generate 124 or 130 HP… Okay, sure, you could upgrade to its expensive SR Turbo Engine, but then your fuel economy drops. Would you like to test drive the 2018 Toyota Corolla today? Call us! Or get in touch with us on our website or stop by our showroom in person. After all, Andy Mohr Toyota is only a quick drive away from Indianapolis, Avon, and Plainfield, Indiana. That means the 2018 Toyota Corolla is only a quick drive away, as well. Are you ready to start your next Toyota journey? If you are, we’re here to help. 12018 EPA-estimated mileage. Actual mileage will vary.